Both geographical indications lie in the Mount Lofty Ranges which run from south of Adelaide, not quite due north, petering out north of Clare. Source: James Halliday Wine Atlas of Australia, 2006, with Winkler zone added. Despite their overt differences, these two regions are the highest and coolest parts of South Australia. Eden Valley has similar altitude, but more degree days (1390), though its MJT is only 19.4°C, so it may not be that simple. Eggins also said the weather data suggest a warmer region than he experiences, as cool afternoon breezes are an important retardant of ripening. 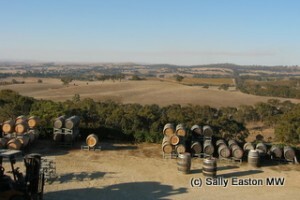 Where Adelaide Hills is a region 70km by 30km, Clare Valley is just 22km by 7km. Eggins explained “the four things that drive quality in Clare are the altitude, the diurnal temperature variation, soils and sunshine hours.” The added “wind is the biggest viticultural problem in Clare. It comes from the west. You don’t want to be on one of the two exposed ridges” that comprise Clare. Big ripening season diurnal swings, up to 27°C (35°C à 8°C) and shallow soils on weathered old rock and limestone are cited as quality factors. Pale colour, lemon sherbet, tart and angular. In the zesty New Zealand mould, but this is limey and sherbet, with notable CO2 spritz and front of mouth intensity. Cream and a hint of butter on the nose, smooth, rounded, supple texture, sweet peach compote and vanilla ice cream, hint more fatness in this wine. Sweet and forward and lush with vanilla ice keeping it all in perspective. Long and luscious style. Creamy and yeasty-sweet fat. Richly toasted, smooth, peachy, showing little sign of maturity. Long and vg. Fresh melon, peach, acacia blossom. Floral and light and young, with good intensity and balance. Still needs to put on a bit of weight. Red berry and menthol nose, youthful texture, high alcohol attack at front. Big and bold upfront fruit, with a bit of angularity to the texture. Perhaps lacks a bit of refinement, with a grainy texture of warmth. Smoke and blackcurrant fruit on the nose, more moderate attack (younger and lower alcohol). Sweet red berries attack, with youthful, smooth and sweet yet defined tannins. Sweet bowl of fruit mid palate, then a fresh finish, creating a nice mouthful, overall. Menthol-spiced blackcurrants on the nose, smooth and rich, sweet fruit, with big concentration. No sign of age t all. Very good in a big style which has very good definition and boundaries. Menthol and broad, prematurely mature, for sure. Developing some fruitcake, earthiness and dried biscuit. Bottle issue we’re thinking. Bright, ripe red fruits, sweet and spicy plums on the palate. Very smooth texture with fine tannin silkiness. Bright, fresh, refined. Lovely. Spicy gorse and vanilla toastiness. Sweet plum and aromatic spiced fruts. Huge, sweet wine, quite Barossa-like with its sweetness and warmth. A big wine and good for that. Hints of leafiness on the nose here. Black peppercorn attack with red berry fruits, very smooth tannic texture, bright and focused. Not picking up the star anise that Edwards mentioned. But definitely medium bodied with elegant mid palate profile. Vg. Spice, black pepper nose. Smooth and silky texture, medium body, pretty seamless integration here. Warmth of alcohol at the finish a positive feature. Black plum fruits. Long and vg.